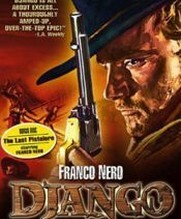 Franco Nero. Loredana Nusciak. Jose Bodalo. Angel Alvarez. Western. Spaghetti Western. Action/Adventure. Drama. 19th Century. Robberies Burglaries Heists. Guns. Violence. Desert. 01 Kelly's Heroes. Guardian 1000 Must See (2007). Historical. Recommended. One of the finest Spaghetti's in the west! Banned for 25 years, it has lost nothing of its hard-edged impact. The gringos are bad and the law are worse! The hero, Django, dispenses justice from a smoking Gatling gun, and sounds like a dubbed Clint Eastwood. Absolutely superb!